The excavations of Pompeii and Herculaneum, occurring during the nineteenth-century, joined together archaeology, literature, and art through a unique and disturbing cultural phenomenon: the discovery and artistic replication of human impressions and body cavities left behind in the ruins of these ancient and annihilated cities. This appendix incorporates visual imagery and historical context to speak about this elusive cultural moment, which had a great influence on Hemans’ poetry. First published in September 1827 in the New Monthly Magazine and Literary Journal, Hemans’ poem “The Image in Lava” refers explicitly – in a footnote – and implicitly – in its subject matter – to a volcanic imprint discovered in the excavation of Herculaneum. After being rapidly destroyed by an earthquake in AD 79, Pompeii and the surrounding cities (including Herculaneum) lay buried under “thirteen feet os solidified volcanic ash, stone, and lava” (Bridges 429). As the saying goes, Pompeii was out of sight, out of mind – at least until the mid 1700s when archaeologists took an interest in recovering the ancient cities. Excavations of the cities uncovered incredible artifacts and human remains, and by the “early nineteenth century, Pompeii had become a popular attraction along the Grand Tour” (Bridges 429). The July 2 and July 16 issues of The Times magazine published in 1827 “carried reports of new find at Pompeii” (Armstrong 218). “Hemans was an avid reader” and there is a general likelihood that she may have read about the great discoveries – including human impressions – in these news publications (Armstrong 219). The exact “image” Hemans is referring to has yet to be found (a search I am actively undertaking myself out of both personal interest and scholarly intrigue); however, with the proliferation of findings publicized in the news across the UK, it is undoubtable that she saw pictures of these bizarre human impressions. Below are examples of the impressions and images created or discovered during the excavations of the ruined cities. To clarify, the impressions were fossilized imprints of human figures in the rock and sediment – this is what Hemans is writing about. The more famous from of human replication from the Pompeii excavations were images. In February 1863, radical Italian archaeologist, Giuseppe Fiorelli, made an innovative discovery: “Fiorelli realised that where people had been covered in ashes and died, the ashes had gone hard and the body had rotted leaving a cavity” (“Fiorelli’s Process”). Pouring plaster of paris into the “voids in the ash, created detailed impressions of long-vanished organic objects” (Roberts 296). Fiorelli was therefore able to create monuments that depicted the victims final moments. 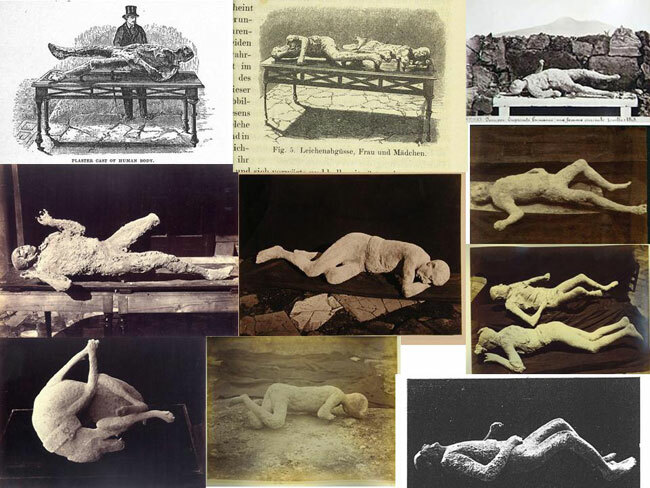 The casts were an immediate success – both within the scholarly community, as they aided with dating and forensic examination, and within the general populous as the eery technique easily captured attention. For more information on the specifics of creating the plaster cast images, please click here.